TechDirt Explains How Microsoft/BSA/IDC Game the Press, GNU/Linux is Getting Games! EARLIER TODAY we wrote about the latest Microsoft/BSA/IDC propaganda, which is an annual ritual that predictably involves lies flooding the mainstream press. This morning when we wrote about it we hadn’t yet spotted the obligatory response from TechDirt, which always throws cold water at this annual propaganda of Microsoft/BSA/IDC (it’s always the same players, every year). Like the swallows returning to Capistrano, every May is marked by the release of intentionally misleading and bogus stats from the Business Software Alliance (or, more accurately, the Bogus Stats Alliance) concerning software “piracy.” As with every other year, the stats are compiled by IDC, despite the fact that even IDC has admitted in the past that the BSA is purposely misrepresenting their findings. You would think, at some point, that IDC would stop providing numbers that are blatantly misrepresented… but I guess if the money’s green, IDC will give you the numbers you want. We’ve been covering these bogus stat reports for many years, providing a detailed look at how misleading the stats are, and pointing out how many in the press simply parrot the numbers without question. Two years ago, a VP at the BSA (who’s now working at the Justice Department, of course) was kind enough to call me to try to explain the BSA’s numbers (along with a PR person and a representative from IDC). When I challenged them on the whole “one copy equals one sale thing” they insisted that their numbers showed such a claim was accurate. They just repeat the numbers — the same numbers the US government just said were bunk — as if they were pure fact. Just a sampling: the AFP, the BBC, ComputerWeekly, Computerworld, the UK Press Association, Network World, eWeek and many, many others. But that’s about all I could find. For the most part, the press — the one’s we’re told are supposed to be asking all the “tough” questions, simply reposted the BSA’s press release as fact. I bought in when they announced they would be Open Sourcing the games – I haven’t gotten around to actually playing any of them yet! With programs like this, and Valve bringing Steam/TF2/HL2 to Linux, the future is looking bright. Now this is simply amazing. Nils Grotnes emailed me about 20 minutes ago with some pretty cool news. Aquaria by Bit Blot ,Gish Published by Chronic Logic, Lugaru HD by Wolfire, and Penumbra Overture of course by Frictional Games have pledged to go open source. On the proprietary side too, there is good news for GNU/Linux (but not so much for Wine as a product which get repackaged and sold). 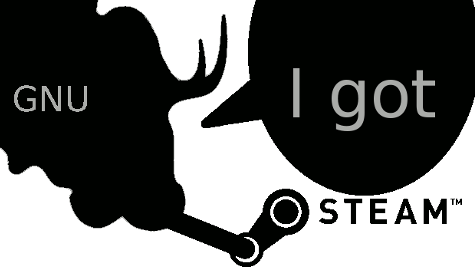 Steam is now officially coming to GNU/Linux. Valve Corporation has today rolled out their Steam Mac OS X client to the general public and confirmed something we have been reporting for two years: the Steam content delivery platform and Source Engine are coming to Linux. This news is coming days after we discovered proof in Steam’s Mac OS X Client of Linux support and subsequently found more Linux references and even the unreleased Steam Linux client. The day has finally come and Linux gamers around the world have a reason to rejoice, as this is the biggest news for the Linux gaming community that sees very few tier-one titles. Still, progress is progress and Valve bringing the Steam infrastructure to Linux along with a few “AAA” titles is progress indeed. Of course Team Apologista will still spout the company line of “1%” marketshare. Does anyone really think a top-tier PC games company like Valve would bring their platform and their games to Linux if its install base was anywhere near as low as the Microsofties always claim? I’ll tell you one thing. Yesterday I spent 1.5-2 hours fighting Windows zombies (all of them Win/IE) that account for no less than 98% of the traffic in one site of mine (Iuron.com). For the past year I’ve been paying extra for bandwidth because of them. Suffice to say, it made me grumpy. Having looked at the statistics last night (AWStats), I found that with such biblical proportions of spam traffic, no wonder Web statistics are worthless these days in determining market share. Mozilla claims 350 million installations of Firefox. How come we don’t hear about 35% market share globally, as opposed to in Europe alone? Remember: Firefox runs on Windows too! Fedora claims over 24 million installations and Ubuntu claims over 12 million. Not all PCs are connected to the Web and they are not homogeneously distributed, either. And of course 99% of all PCs will be double-counted as Windows machines since they were originally sold with Windows, regardless of how many of them are now running in dual-boot mode or running Linux only. There is IP address ambiguity, yes. I wrote an article about it some years ago.